Governor Andrew M. Cuomo today announced the new National Comedy Center in Jamestown, New York has officially broken ground. The $45 million center celebrates the history of comedy, the craft, and its contributors. To celebrate the start of construction, more than 40 events this weekend will include comedy greats such as Jerry Seinfeld, Melissa Rivers, Regis Philbin, Nick Offerman, Kelly Carlin, the family of Harold Ramis, and many others. The National Comedy Center project includes the renovation of two historic buildings as well as the construction of a new building. It is expected to attract over 114,000 visitors each year and give a $23 million boost to the local economy annually, while also sparking further economic development and helping to improve the economic environment in the region. The National Comedy Center is anticipated to generate 218 jobs and $6.5 million in wages per year in the three counties of Chautauqua, Cattaraugus, & Erie. In December 2014, Governor Cuomo awarded the National Comedy Center project an Economic Development Grant of $1,500,000. With this award, the project became a key part of the long term economic development and tourism strategy for New York State which will allow it to play a partnership role in regional, statewide and national marketing campaigns such as the revitalized I Love NY Program. Construction will begin in the spring of 2016. Fabrication and installation of the attraction components along with the content acquisition process will follow and a target opening in late spring 2017 has been established. The 501(c)(3) non-profit National Comedy Center is designed by renowned creative firm Jack Rouse Associates and interactive specialist Local Projects to honor the craft and its legendary contributors with its interactive exhibit experience, celebrate the best of contemporary comedy with its programming, and cultivate the comedic arts with professional development and support for artists. The National Comedy Center represents the expansion of the National Comedy Center, Inc. and fulfills its mission to enrich the world through the healing power of laughter with its commitment to the celebration of the comedic arts. Reuse and fit out of the wings of the of the historic Jamestown Gateway train station, which recently underwent a $12 million restoration of its center concourse and building envelope. Renovation of a second building to house nearly an acre of exhibition space. New construction of a 6,000 square-foot building that will be the entrance to the attraction and feature 2 full height high definition video screens. When complete, the National Comedy Center will offer approximately 28,000 square feet of attraction space for its patrons to enjoy. Assemblyman Andy Goodell said, "Jamestown takes comedy seriously. We appreciate Governor Cuomo's support for this important smart growth project that will contribute to the economic revitalization of the region." 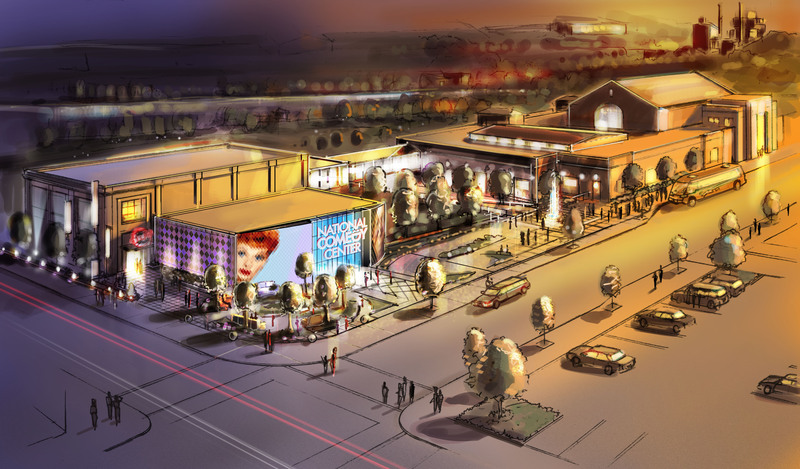 The National Comedy Center is part of a four-pillar Legacy of Laughter vision for the Lucille Ball Desi Arnaz Museum & Center for Comedy, including a comedic arts education program, a comedy film festival and the annual Lucille Ball Comedy Festival. Lucille Ball’s hometown of Jamestown, NY honors the legacy of “The First Couple of Comedy” with the Lucille Ball Desi Arnaz Museum. The museum attraction is open seven days a week, and features replica sets, Lucille Ball’s Emmy awards, costumes, rare memorabilia, and much more. For additional information on the Lucy Desi Museum & Center for Comedy, as well as its online gift shop, visit www.lucy-desi.com.